Andersons Angels: Kidzbop Toothbrushes! Gift Guide Spotlight! 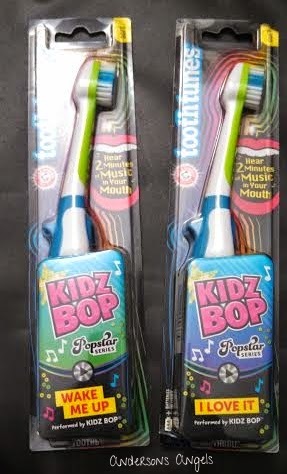 Kidzbop Toothbrushes! Gift Guide Spotlight! Do you have a hard time finding stocking stuffers for your kids? I know that this is one thing I struggle with every year. I hate filling the kids' stocking's with candy and cheap toys that will break quickly. I remember growing up that my Grandma would always get me a new toothbrush and toothpaste for my stocking. Yes that may seem weird to some but good dental hygiene should be a gift we give to all children. This year my kids will be getting a new tooth tunes toothbrushes in their stockings. One thing that our family takes seriously is dental hygiene. We are always looking for ways to make the kids teeth brushing routine fun for them and these fun toothbrushes will do just that. All the kids have to do is turn it on and start brushing their teeth to hear two minutes of their favorite music pumped directly through their teeth straight to their head. Two minutes is the dentist recommended time for brushing teeth to help fight cavities and remove plaque. They have tooth tunes brushes for the little kids as well with the tooth tunes junior brushes. The junior toothbrushes are made for kids ages 3+. The tooth tunes toothbrushes are designed with soft bristles and an angled brush head that is perfect for smaller mouths. The junior brush also has a smaller handle that is just right for small hands. Batteries are included with each brush and will last for three months when brushing for two minutes twice a day. Rock & Roll all night is one of the songs. This will definately entertain my crew! I learned that Sound vibrations stream from the bristles through your teeth so you hear music in your head. You won't hear the music until you start brushing. I learned that it plays 2 mins of music! Soft bristles and easy to hold handle for little ones! I learned they make a junior brush for a year olds. 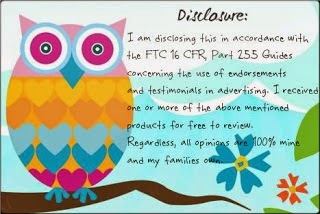 I learned, under their brushing tips section, to be sure your toothbrush has soft bristles. I suppose I already knew that, but it's good information! I learned that the music will play for 2 minutes and when it stops, it's time to stop brushing! I learned that kids brush up to 50% longer when they use Arm & Hammer Tooth Tunes. DK Books! Giving Thanks Spotlight! Ornaments with Love! Gift Guide Spotlight! Carved Solutions! Giving Thanks Spotlight! Pixtagram Magnet! Giving Thanks Spotlight! Emerson Creek Pottery! Giving Thanks Spotlight!